2. 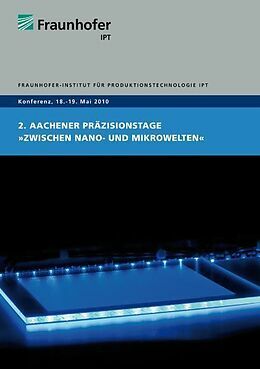 Aachener Präzisionstage "Zwischen Nano- und Mikrowelten"
The market for micro technology is growing rapidly and is developing to one of the strongest technology sectors. The proceeding miniaturization has a strong influence on products out of the fields of consumer goods, life science, and automotive industry. Primarily these emerging markets with a huge demand on high precision manufacturing technology contribute to strengthen effectively high-wage countries. Fraunhofer IPT forces a panel for the precision and ultraprecision technology with the 2nd. Aachen Precision Days that is characterized especially by its relevance for industrial applications. The international conference focuses on aspects in machine, process, and measurement technology. The Aachen Precision Days as well as the workshops of the Centre for Precision and Micro Technology focus on ongoing technological trends. 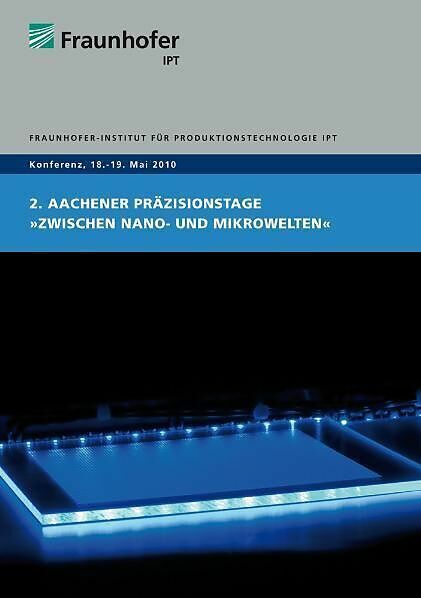 Consequently the Fraunhofer IPT leads the way by creating a forum for the exchange of know how in the field of precision and ultraprecision technology. Participants of the Aachen Precision Days will learn about trend-setting developments which will be presented by representatives of some of the most innovative companies in the area of micro machining and metrology. Thus for medium-sized businesses as well as for large companies the Fraunhofer IPT is the supporting facility to enable new technologies and products by reviewing trends and latest developments. We looking forward to offering you in the next two days an interesting event, supported by the German Federal Ministry of Education and Research (BMBF) and managed by the Project Management Agency Forschungszentrum Karlsruhe (PTKA). We thank you for your participation and are anxious to hearing your feedback for the Aachen Precision Days. Prof.Dr.-Ing.C.Brecher ist seit Januar 2004, in Nachfolge von Prof.Dr.-Ing.Dr.-Ing.E.h.M.Weck, Inhaber des Lehrstuhles für Werkzeugmaschinen, Direktor des Laboratoriums für Werkzeugmaschinen und Betriebslehre (WZL) der RWTH Aachen und Direktoriumsmitglied des Fraunhofer-Institutes für Produktionstechnologie (IPT) in Aachen, in welchem er die Abteilung Produktionsmaschinen leitet. Titel: 2. Aachener Präzisionstage "Zwischen Nano- und Mikrowelten"